^ Malati J. Shendge. The language of the Harappans: from Akkadian to Sanskrit. Abhinav Publications. 1 January 1997: 46 [22 April 2011]. ISBN 978-81-7017-325-0. ^ Bertman, Stephen. Handbook to life in ancient Mesopotamia. Infobase Publishing. 2003: 340. ISBN 978-0-8160-4346-0. ^ Barton, George Aaron. A sketch of Semitic origins: social and religious. The Macmillan Company. 1902: 262. ^ J. F. Hansman, ARBELA, Encyclopedia Iranica. ^ Curtis, John. The Achaemenid Period in Northern Iraq (PDF). L'archéologie de l'empire achéménide (Paris, France). November 2003: 3–4. ^ Dandamatev, Muhammad: "Assyria. ii- Achaemenid Aθurā", 互联网档案馆的存檔，存档日期2008-05-29. Encyclopaedia Iranica. ^ The Chronicle of Arbela (PDF). （原始内容 (PDF)存档于2004年4月28日）. In 115, the Romans invaded Adiabene and re named it Assyria. ^ The Biblical Geography of Central Asia: with a General Introduction, by Ernst Friedrich Carl Rosenmüller. Page 122. ^ Neusner, Jacob. In Memory of Rabbi and Mrs. Carl Friedman: Studies on the Problem of Tannaim in Babylonia (ca. 130-160 C.E.). Proceedings of the American Academy for Jewish Research. 1962, 30: 79–127. JSTOR 3622535. ^ Ammianus Marcellinus, another fourth-century writer. In his excursus on the Sasanian Empire, he describes Assyria in such a way that there is no mistaking he is talking about lower Mesopotamia (Amm. Marc. XXIII. 6. 15). For Assyria, he lists three major cities – Babylon, Ctesiphon and Seleucia (Amm. Marc. xxIII. 6. 23) – whereas he refers to Adiabene as Assyria priscis temporibus vocitata (Amm. Marc. xxIII. 6. 20). ^ Lightfoot, C. S. Trajan's Parthian War and the Fourth-Century Perspective. Journal of Roman Studies. 1990, 80: 115–126. JSTOR 300283. ^ Dahlman, C. The Political Geography of Kurdistan. Eurasian Geography and Economics. 2002, 43 (4): 271–299 [p. 286]. doi:10.2747/1538-7216.43.4.271. ^ Eskander, Saad. 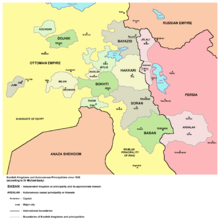 Britain's Policy in Southern Kurdistan: The Formation and Termination of the First Kurdish Government, 1918-1919. British Journal of Middle Eastern Studies. 2000, 27 (2): 139–163 [pp. 151, 152, 155, 160]. doi:10.1080/13530190020000501. ^ Harris, G. S. Ethnic Conflict and the Kurds. Annals of the American Academy of Political and Social Science. 1977, 433 (1): 112–124 [p. 118]. doi:10.1177/000271627743300111. ^ Saedi, Michael J. Kelly ; foreword by Ra'id Juhi al. Ghosts of Halabja : Saddam Hussein and the Kurdish genocide. Westport, Conn.: Praeger Security International. 2008: 18. ISBN 978-0-275-99210-1. ^ O'Ballance, Edgar. The Kurdish Revolt, 1961–1970. Hamden: Archon Books. 1973. ISBN 0208013954. ^ Pollack, Kenneth M. Arabs at War. Lincoln: University of Nebraska Press. 2002. ISBN 0803237332. ^ Harris, G. S. Ethnic Conflict and the Kurds. Annals of the American Academy of Political and Social Science. 1977, 433 (1): 112–124 [pp. 118–120]. doi:10.1177/000271627743300111. ^ Introduction : GENOCIDE IN IRAQ: The Anfal Campaign Against the Kurds (Human Rights Watch Report, 1993). Hrw.org. [2010-12-28]. ^ Page 9 - The Internally Displaced People of Iraq (PDF). The Brookings Institution–SAIS Project. [22 August 2012]. （原始内容 (PDF)存档于2013年5月21日）. ^ Harris, G. S. Ethnic Conflict and the Kurds. Annals of the American Academy of Political and Social Science. 1977, 433 (1): 112–124 [p. 121]. doi:10.1177/000271627743300111. ^ Farouk-Sluglett, M.; Sluglett, P.; Stork, J. Not Quite Armageddon: Impact of the War on Iraq. MERIP Reports. July–September 1984: 24. ^ Death Clouds: Saddam Hussein’s Chemical War Against the Kurds. Dlawer.net. [2010-12-28]. 库尔德斯坦地方政府(KRG) News, progress reports and reference material about Kurds, KRG and Kurdistan Region. The Kurdish Institute of Paris Provides news, bulletins, articles and conference information on the situation in Kurdistan. Kurds, Kurdistan[永久失效連結], The Encyclopaedia of Islam.